After four instalments of the Scomo-ment, it’s time for a commercial break. Like other national icons, Australia’s fourth long-serving Prime Minister has decided it’s only Fair Dinkum that interested sporting groups can project advertisements for their fiestas onto the PM himself. Scott was seen last night trying on all-white suits at Lowe’s, the suburban dad’s outfitter of choice. It will be a gift for the average Australian punter as the Spring Racing season shifts into top gear, to be able to check the odds on the W.S. Cox Plate, Victoria Derby, Caulfield Cup, the Melbourne Cup and more. Depending on quickly he moves, highlights from the cricket tests being played this month against Pakistan will also be streamed onto the PM. Frankly, you cannot get more man of the people than that; and the possibilities are endless. 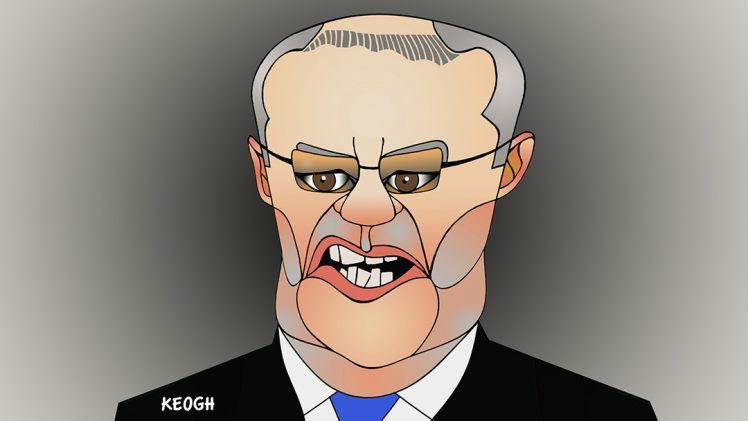 After all, Scott’s given 110 per cent – a figure often bandied around by Australia numerically challenged sportspeople when asked how much effort they gave or good “they done” – to New South Wales Liberal teammate, Premier Gladys Berejiklian and her decision to overrule her own Sydney Opera House appointee, chief Louise Herron’s firm nyet. “It’s just common sense, I don’t see what people are getting so precious about,” said Scott, using his well-established instinct gift for what is and is not common. It is also a truth universally acknowledged, that a teetering political leader in search of election victory must curry favour with wind-farm endangered The Orange Bellied Parrot, Alan “Gloria” Jones — himself a true blue Aussie sporting hero who coached the Australian Rugby Team. Just to prove that this is a bi-partisan, New South Wales opposition leader, Luke Foley, and The Great Left Hope of Federal Labor, Anthony Albanese, have backed the Opera House plan. Still there has been ominous silence from Dave “North Shore” Sharma, the Libs’ smooth-talking candidate for Wentworth as the Opera House projection appears to be going down with voters in Sydney’s monied east like the veritable cup of chilled vomit. Word on the street is that Albo is mulling a similar plan to Scott’s “project on me” project in a last ditch bid to upset Bill Short-odds as Labor leader in time to wrest the Prime Ministerial crown from the determined Scott. The Jonesboy, of course, is simply the bullet-proof messenger of the NSW racing industry (and of course an owner of horse flesh himself) that provided $96 million in revenue in 2016-17, according to Australian Gambling Statistics, a handy stat ferreted out by Crikey’s Margot Saville who also provided a laundry list of revenues from and subsidies to the racing and gambling industries that are run by the rich for the benefit of the rich. No one put it better than H. G. Nelson and Rampaging Roy Slaven’s pitch-perfect cry that “too much sport is barely enough” and this is all part of Scott’s cunning plan to do what no Australian leader since Emeritus Prime Minister John Howard has managed to do — endear himself to the nation as a Fair Dinkum sports lover. Scott has said, at various times that Rugby Union and Rugby League Team the Cronulla Sharks are his true love. After attending what appeared to be his very first Australian Rules Football match at the recent Grand Final and hailing it as “religious experience”, it is only, well, common sense that racing would be next with now subtly promoting the Sport of Kings with some new jargon. Scott’s plan also is fresh evidence of the financial skills that saw him do such an outstanding job as Treasurer and identify the ingenious solution to saving the Great Barrier Reef by handing $444 million to an outfit that didn’t ask for the money. He has now, we hear, instructed the combined brains trusts of the NSW and Federal Liberal party executives to work on the next step — flogging sponsorship on the Opera House sails to the party’s biggest donors, including the PM and Gladys themselves. This could see both the Opera House, Scott and Gladys swathed in the red and yellow flag of the People’s Republic of China. It would be remiss of your humble correspondent to pass without mention of the stunning outing of Environment Minister Melissa “Mt Tom” Price on the IPCC report. It was a “long-bow, she said of the report by 91 scientists from 40 countries deploying 6,000 cited references, 42,001 expert and government review comments in three drafts using 133 contributing authors. Although she, and nobody else in the government appears to have read it, that matters little because, as Mel said, “We are comfortable where we are heading”. Just like the environment itself. Masterfully, the former mining executive stuck to her talking points in an interview with the ABC’s Sabra Lane: “It’s not too bad”, “many possible pathways”, IPCC report is just some peoples “opinions”, “we are meeting our Paris commitments”, “as a responsible and measured government, we need to have a look at it” and … drumroll … Bill Shorten. Indubitably however, the high-water mark of this spectacular tete-a-tete was the Minister’s revelation of the Government’s Forestry Plan: “We plan … to build trees”. Like making “clean coal”, there is high ambition in building trees. It is not known whether trees have actually been built before so Melissa is bringing hitherto unthinkable innovation to the Environment portfolio. Want to catch up on past episodes of the Chronicles of a Fleeting Prime Minister? Episode I here; Episode II here, Episode III here and Episode IV here. You can can also follow Michael at Little Red Blog or on Twitter@sainsburychina.